As New Year approaches we start making plans for the next year evaluating the main changes we want to introduce in the nearest future. Dealing with eCommerce sphere you are well aware of highly competitive market and demands of customers that grow with breakneck speed. To stay afloat and cope with the challenges online merchants spent this period planning and making predictions. And that’s the key to success! Dale Carnegie said: “An hour of planning saves you 10 hours of doing”. In this article, we present comprehensive BigCommerce review that will take you a couple of minutes to read and will spare you hours of researching. BigCommerce should be in the list of the platforms you consider to migrate to in 2018 and here is why. BigCommerce is one of the best eCommerce platforms currently available on the market. It is a self-hosted software solution enabling you vast customization capabilities. BigCommerce is one of those online store builders that will free up your time and save resources launching and managing e-shop. Selecting this cart you will be able to sell on most used marketplaces such as eBay, create a list of products on Amazon, take advantage of social media marketing and Google Shopping. You can sell from store both being online and off and install Buy Button that gives your clients opportunity make orders from emails and blogs you create with your team. The year 2017 has turned into real succes for BigCommerce eCommerce platform. It has made a huge leap forward and has earned the loyalty of online merchants worldwide. By introducing advanced eCommerce capabilities and variety of cool functions the Bigcommerce eCommerce has turned into one of the most popular platforms. 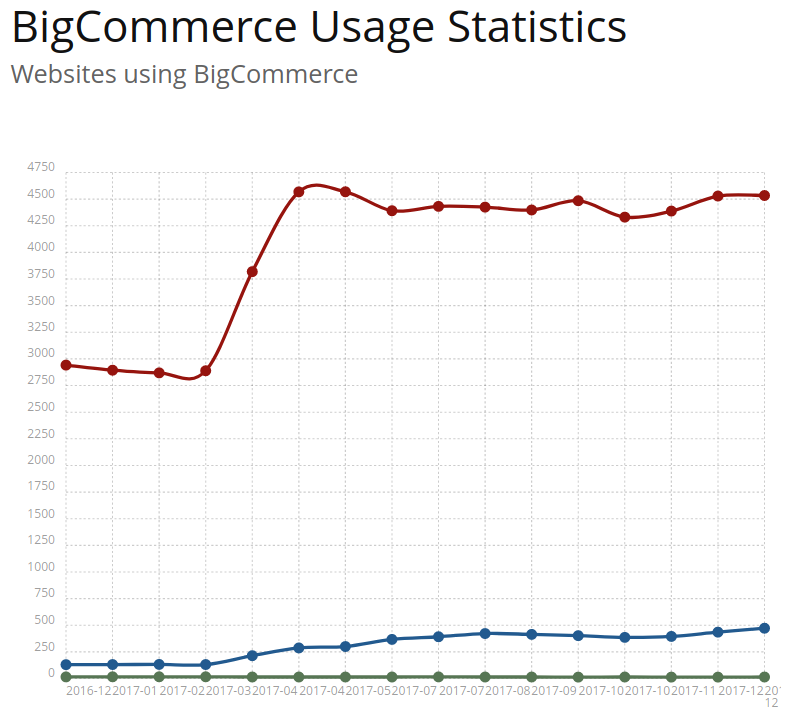 Trends.builtwith.com statistic shows at the beginning of 2017 the number of Bigcommerce online stores has increased by 63%. What is most significant, The platform has managed to hold the positions throughout the year and currently it empowers 67,018 live websites. 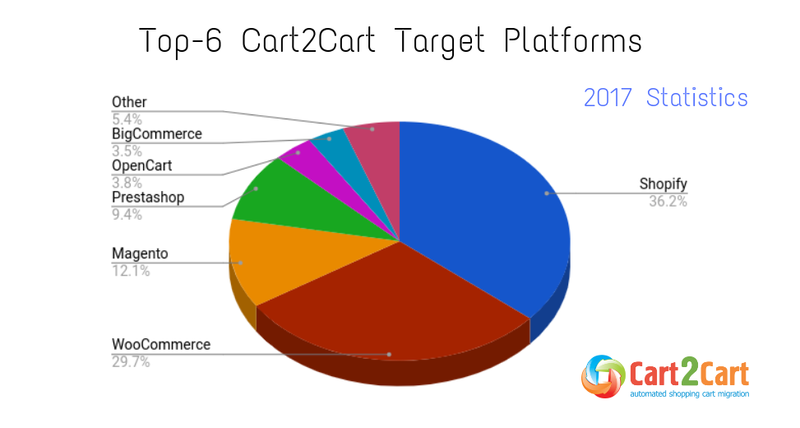 The Cart2Cart statistics shows that Bigcommerce is among Top-7 Target Carts online vendors migrated to in 2017. According to Cart2Cart automated migration service report of the previous year performance, almost 4% of clients chose BigCommerce their Target Platform and successfully migrated their store to it. If to consider the fact that Cart2Cart supports migration from and to more than 80 shopping carts, it is a significant amount. The chart below illustrates the leading shopping carts Cart2Cart clients imported their eCommerce data to. 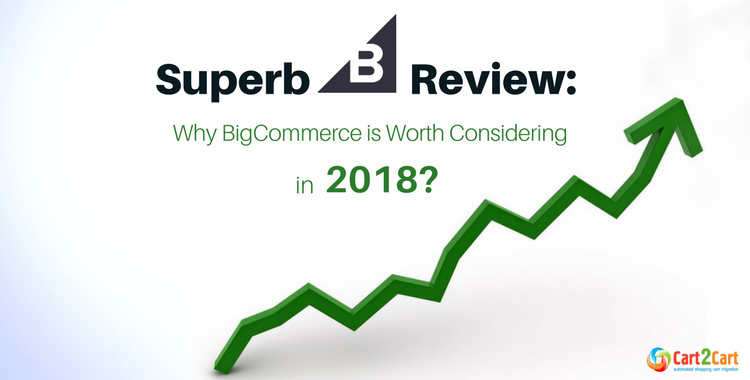 We predict BigCommerce even greater increase in 2018 - it introduces innovations even the most popular platforms do not have. The platform offers absolute transaction fee freedom. The number of its users increase rapidly and it will in the future - it is a great alternative to the most popular carts currently available on the market. Online store can be created in a couple of clicks. Fill in the short registration form and in a few seconds you are redirected to your live store admin panel. The themes look professional and elegant. You might have difficulty picking the one you like the most because there are numerous designs to choose from. 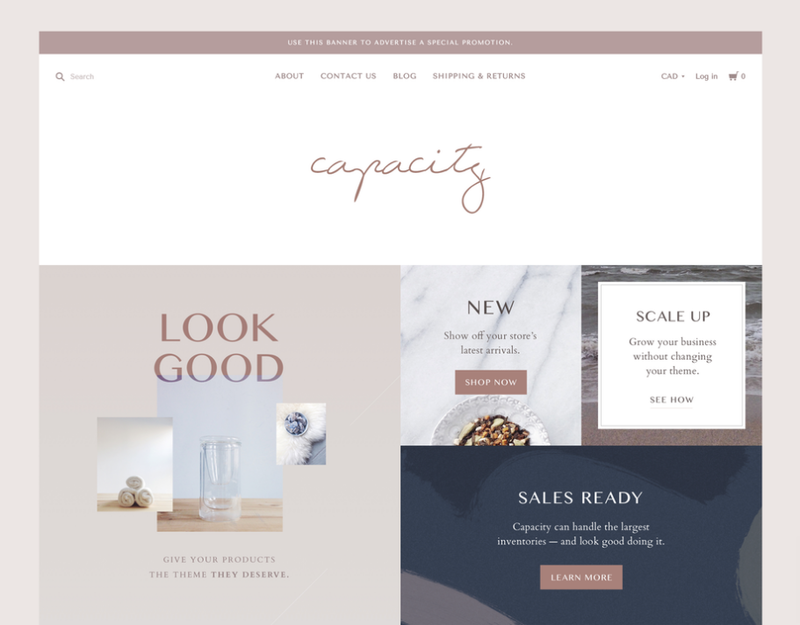 BigCommerce Theme Store offers both free and paid templates that will satisfy even the most impeccable taste. BigCommerce is self-hosted eCommerce solution that enables you to personalize your cart and make it look the way YOU wish. Most importantly, the shopping cart offers code-free updates that will save you much time managing your online store. Plus, this solution gives you opportunity to use the common coding languages what makes BigCommerce the favorite platform among professional developers. The platform enables editing of the HTML/CSS of the template you’ve chosen using in-browser editor. Receive 99,99% store uptime and website hosting taken care of. It will help you to concentrate on selling rather than dealing with the tech aspects. This will guarantee you’ll have fast website with higher conversion level. You will easily manage products, process orders and inventory, edit and add pages, streamline order fulfillment form single location. It is predicted that mobile retail commerce revenue will reach the number of 669 billion U.S. dollars in 2018. BigCommerce offers the latest mobile selling features and enables creation a webstore fully mobile optimized. Directly from the Admin panel you’ll be able to use the leading eCommerce tools such as ShipStation and ShipperHQ for shipping products, Avalara for calculating the taxes automatically, and many others. Bigcommerce app store contains variety of 3-d party plugins that will help you to enlarge your online shop capacity regarding marketing, inventory management, shipping, accounting and other important aspects. Starting blog is a matter of a few clicks as no additional software is required. You will be able to grow and promote your brand using the functionality to interact with your clients and increase their loyalty to your company. The shopping cart offers efficient marketing module with AdWords integration, coupons and other valuable functionality. You should not worry about additional cost for payment transactions - there are no extra fees. Indeed, it is a great advantage over other platforms! BigCommerce offers 24/7 professional assistance. Support Managers are available via phone, email or chat. Official website claims that 90% of issues are solved on the 1st call. Our comprehensive BigCommerce review contains all the key benefits you get from choosing this software solution to base your e-shop on. BigCommerce will provide you with extensive functionality to succeed with online store and achieve even the most challenging goals. The best part? If you already having an online store but it is not the one you dream of - turn to Cart2Cart for help. Automated migration service will transfer all your eCommerce data smoothly and effortlessly. Cart2Cart 24/7 Support team is there to assist you on every step of migration. There is a unique chance to try the service in advance. Before actual data export you can perform Demo Migration which is cost-free and enables to migrate a limited amount of items to your live BigCommerce store within 30 minutes. Once you are satisfied with Test Transfer proceed with Full Migration. The main advantage - your current store performance won’t be affected during data migration - Cart2Cart guarantees 100% Source Cart uptime. Ready to make a big step forward and migrate your eCommerce entities to a robust platform! Perform Free Demo and see that BigCommerce is the perfect match!